Winter weddings lend themselves well to soft hues of blue, silver and white. An indoor wedding may require more planning for decorations and entertainment, but you can design a wedding that will offer lasting memories for yourself and all of your guests. 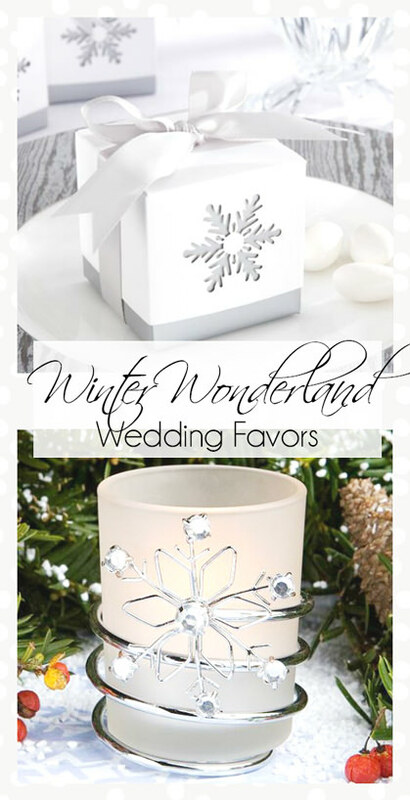 The following winter wonderland wedding theme favors will help everyone remember your special day long after the weather turns warm. 1. 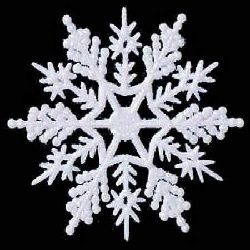 Glitter Snowflakes - If you are trying to make your own winter wonderland wedding theme decorations and favors, these glittery white snowflakes are essential supplies. 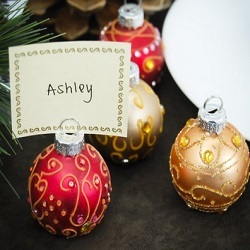 You can hang them around your wedding venue as decorations, set them on tables as favors for your guests, or let them serve double duty as decorative elements that your guests can take home. 2. 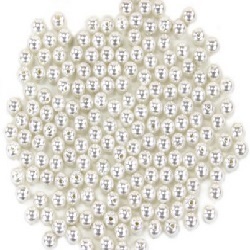 Vintage Pearl Vase Fillers -Not only will these vintage pearls look beautiful filling up large vases, but you can use them for a variety of arts and crafts projects after the wedding. You may also use them to string necklaces or bracelets for members of the wedding party as gifts of appreciation. (how do you do that? I only want to add this sentence if it is easy for someone to do…I couldn’t find anywhere in the listing that said you could string them for jewelry) Work them into your table centerpieces for fast and easy DIY wedding decorations. 3. 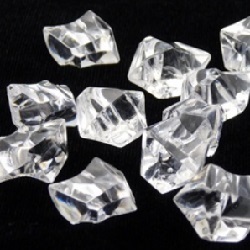 Acrylic Crystal Ice Rocks - If you have ever scattered confetti over a tablecloth when decorating for a birthday or graduation party, you know just how to use these crystal ice rocks. 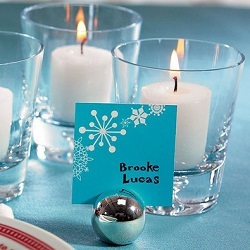 Throw them around each table for a touch of elegance, and encourage your guests to take one in memory of your big day. 4. 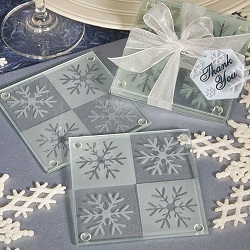 Glass Snowflake Coasters - Decorate for your wedding, and then let it snow, let it snow, let it snow. These glass coasters are beautifully wrapped in clear containers and bows, so they are ready to distribute as memory-makers for all of your loved ones. Each package contains two coasters. 5. Brownie Favor Pops - Are you worried that you will waste money on favors only to have most of your guests toss them into a drawer and forget about them? That won’t happen if you make your favors a delicious treat. 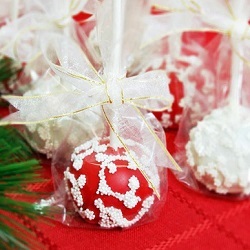 These favor pops are delicious brownie balls decorated to look like ornaments, pumpkins or snowflakes. You can select from different colors and patterns so that your winter wedding favors tie perfectly to your theme. 6. 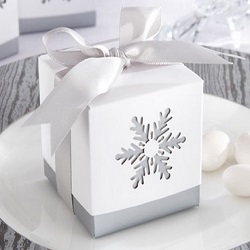 Laser-Cut Snowflake Favor Boxes - If you are planning your wedding on a tight budget or want to incorporate small personalized candies into your table décor, these favor boxes are the perfect solution. They are sold in sets of 24 with bows that tie each box together beautifully. Fill them with candies for your loved ones to enjoy. 7. 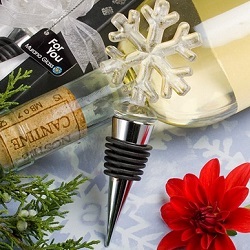 Glass Snowflake Wine Bottle Stopper - This may not be a favor that you want to hand out to every guest at your wedding, but it is a special treat for yourself and perhaps the members of your wedding party. You can even scatter them along the bar for lucky guests to claim. 9. Silver Ball Place Card Holders - These simple, yet elegant, place card holders will fit into your theme without stealing attention from other decorative elements. You will find many other ways to use them over the years, including pulling them out for your wedding anniversary parties and intimate dinners. 10. 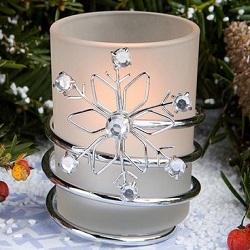 Jeweled Snowflake Votive Holders - This is the type of wedding favor that you can include in your decorative plan and count as gifts to your guests. Scatter them around tables, place them next to table settings, or simply hand them out to your guests to show your appreciation.